GOLFERS FROM AROUND THE WORLD COME TO CHALLENGE THE JUDGE and the two other golf courses in Prattville at RTJ Capitol Hill. Bring your clubs and come take on Judge hole number 1, voted the favorite hole on the Trail. Complete your day in luxury at the Marriott and enjoy dining, fi repits and guest rooms overlooking the Senator golf course. With the Marriott's 20,000 square feet of meeting space, 96 guest rooms and luxurious Presidential Cottage combined with three world-class golf courses, business and pleasure can defi nitely interact in Prattville. THE ROBERT TRENT JONES GOLF TRAIL AT CAPITOL HILL is home of the Yokohama Tire LPGA Classic on the Senator Course September 18 to 24, 2014. 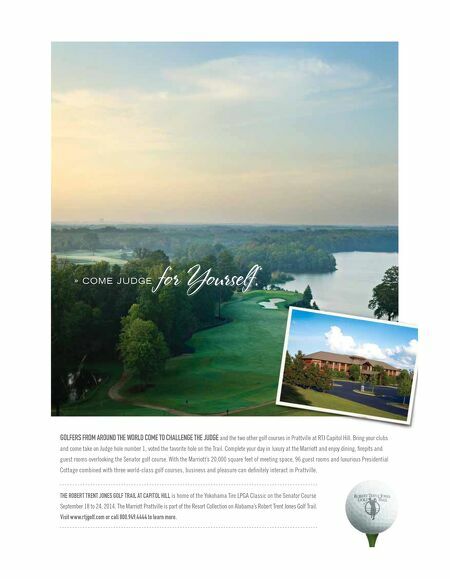 The Marriott Prattville is part of the Resort Collection on Alabama's Robert Trent Jones Golf Trail. Visit www.rtjgolf.com or call 800.949.4444 to learn more. » COME JUDGE for Yourself.